In the debut issue of this Marvel NOW! title, we were introduced to Sam Alexander. In my review of Nova #1, I mentioned that not only is Sam a typical teenager with a bad attitude, he is also the kid in the Ultimate Spider-Man cartoon. This issue picks up where that issue ended; Sam waking up in a hospital room with Gamora and Rocket Raccoon standing in front of him. 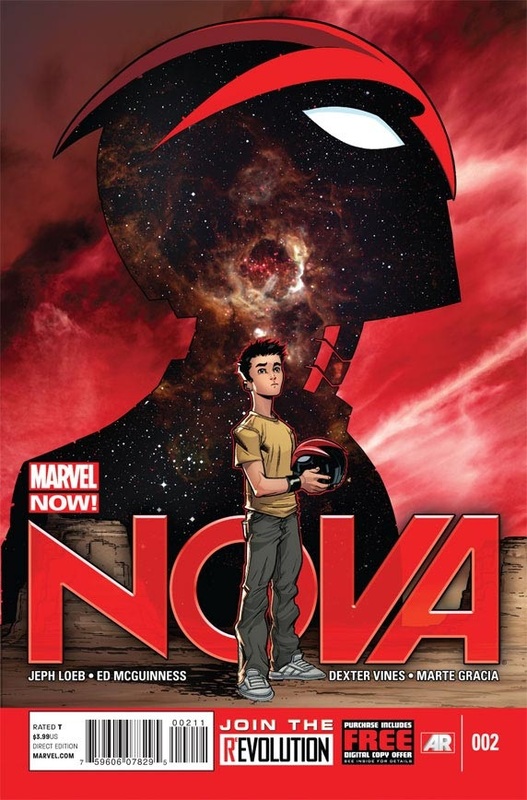 Without spoiling the story, I’ll tell you that Sam discovers he is now a Nova, and that all the stories his dad told him and his sister are true. I’m liking this story so far and I plan to read more issues to see where it’s going. In addition to his attitude problem, Sam is also impulsive. So I’m looking forward to reading how Sam will take to his newfound powers. Will he mature overnight? How will he learn or who will teach him about his powers and its’ limitations? What will his mother say (I can tell by her expression that she knows)? Will Gamora and Rocket Raccoon return? I hope so because I really like them. Especially Rocket Raccoon. He is definitely not one to mess with. I learned that within the first couple of pages. Jeph Loeb is the writer. Dialogue is well written. It’s reader friendly for all ages. Great pacing. I love the artwork. The art team consists of Ed McGuinness (penciler), Dexter Vines (inker) and Marte Gracia (colorist). I’m liking Nova’s costume (I wish I had a helmet with powers). I find some of the panels to be life-like, emotion sparking. Like that scary Rocket Raccoon. Or the hologram of Jesse, Sam’s dad. I recommend Nova. Reader friendly at the perfect pace for all ages.